Thorens launches 900-series turntables | What Hi-Fi? 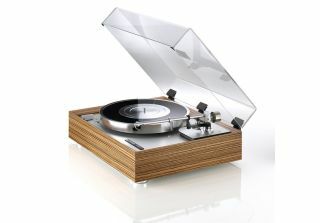 Thorens' new range has a stylish retro look, but uses new materials and new turntable architecture. Thorens has lifted the lid on the 900-series, its new range of retro-styled turntables. The range pays homage to the TD 170 and TD 160, two classic decks from the 1960s and 70s. While models in the new range have a similar sub-chassis look, Thorens has reworked the design with a focus on squeezing the best possible sound quality out of them. All three are made of Tricom, an aluminium/POM composite with excellent damping properties and high stiffness. The motor is mounted directly into the damped sub-chassis to reduce vibrations, driving the sub-platter via a machined precision belt. The sub-chassis is suspended with three conical springs, which can be adjusted to create uniform tension. The bearing is optimised for smooth running, being made of sintered bronze with a Teflon thrust pad. The steel axle provides low but constant friction, giving the motor a uniform load. The 907 sits at the top of the range, with the 903 the most affordable and the 905 in the middle. The only differences between them are the damping architecture, tonearm board and platter used. For more info, check out the Thorens website.